Hola People! Hope you are having an exceptional start to the week! Work is keeping me busy---which I like---so that the work hours go by faster! lol I am having some serious trouble staying away from blazers! I just love their structured look and how you can wear them with anything. It's getting hotter in Texas by the day--but, I'm going to keep wearing them! I'm blazer-sessed! Love the outfit... I need that dress!! Love all the outfit! You're beautiful! You look so cute! It is already hot here too. I will keep wearing my blazers too! i love that dress, it looks so great on you. also, that blazer so cute. i am already too hot today, but i love cardigans so i still wear them. im dying haha. Love your dress. The colour is great! Blazers are my favorite. I don't even own any cardigans. I just put a blazer over everything! Also-where is your gold cuff from? I really love it! Your dress is so cute, love the color. And your earrings are adorable! you are SO adorable. and yes, i'm blazer-sessed too! 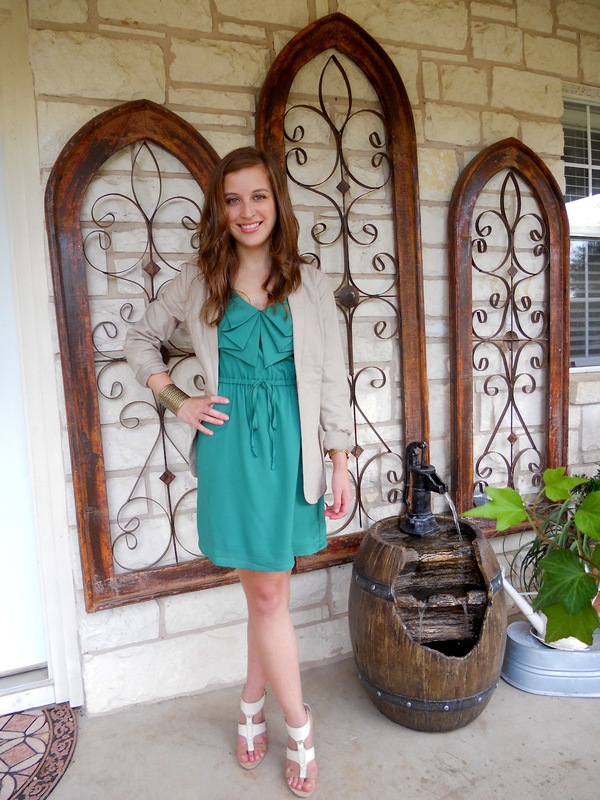 Great dress AND blazer! Love the bracelet too! Love the dress! Such a pretty color! I love blazer's too I think they make any outfit that much more special! I'm in love with this dress!! It looks so amazing on you and the color suits you so well. I can never pull these off because of the waist-band being too high, but I keep ordering them online in hopes that they will fit! Wow teal is an amazing colour for you...love the gold cuff too, really good statement piece! OOhh..that dress! I love it. I have a blazer fetish, as well. :) Just bought 3 last week! Oy! I love me a good blazer. It truly is a fix-all. The ruffles on this dress are so great! That color is so great on you! Oooh, that really is a gorgeous blazer! Haha, it adds such a chic touch. Love it with the cute dress. The emerald green shade is beautiful! Love your wavy hairstyle! Very cute! Great dress! and love that arm cuff :) reminds me of something a greek goddess would wear! You are so so pretty. That blazer works so well with that dress! I tried to pull of a blazer and dress combo the other day...but the blazer was so awkwardly long on me that it looked like I was wearing two dresses or something. You nailed it though!! I truly believe that blazers make everything look better. This dress is beautiful on its own, though. I love the color on you. I love the top of the dress, and the fact that is has pockets makes it even better! That dress is such a lovely color on you, French Connection always have amaaazing dresses. I love the way you paired it with gold accessories! Hey Giovanna! I feel like I haven't visited you in forever! Work is keeping me busy too, but I don't mind:) I have found myself buying more and more blazers this year! They make all outfits so versatile:) Your dress is gorgeous! Adore this! you look so so stunning! Love the dress and the color is very flattering on you. It has pockets...even better!!! Your sandals are adorable. hey hey love your dress. following you. would you mind following me back? You look amazing in this dress!! First time I stop by your blog and I really enjoy reading it. Would you like to follow each other? Giovanna this color makes your skin glow. It's perfect for you!! And I also love the cut!! Such a cute outfit, I absolutely love the dress! 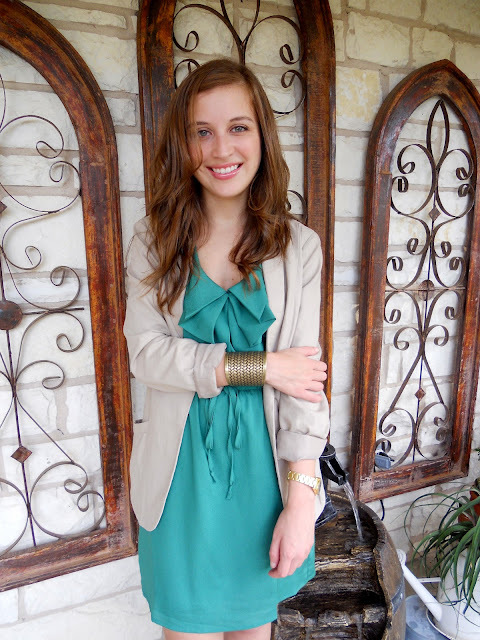 Blazers & dresses are one of my fave combos - you look so cute! And love that gold cuff! Thanks for your comment, and beautiful outfit. Your dress is amazing. Beautiful dress and smile :)! Thanks for your lovely comment, means a lot :). great dress and even though it is getting hot, the stores and offices are freezing! I absolutely.... absolutely.. love this dress. Crap. Now I think i need one. Love this pairing! The color of that dress is divine. I love that teal color on you! So Pretty!